now those are some legs. he's a unique fellow! cute one, jp! he's a cute little pal too. Such a ham looking at you in the first photo! Just lurking ... what a neat critter. He is so unusual!! Great snaps. Delightful and in no hurry. Your friend is cute, great shots! Enjoy your weekend! Fantastic little fellow but kept at a distance would be good. Delightfully brilliant colours. 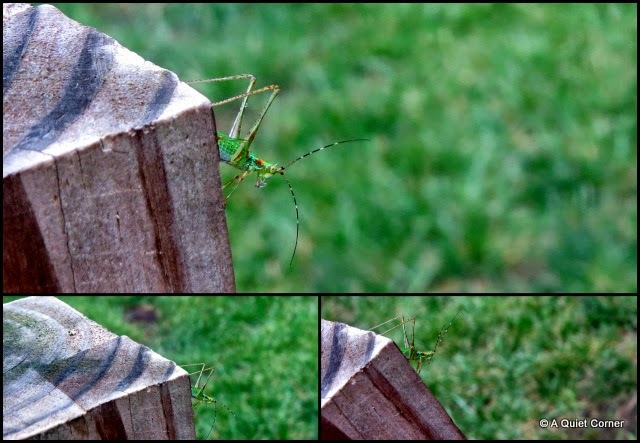 I have never seen a grasshopper so large. A very unique specy of one. Well worth the wait, so happy you caught him for a photo shoot!